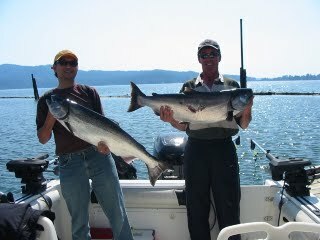 Sooke salmon fishing is a mixed bag these days. There are definitely nice fish out there, but you have to be in the right place at the right time. "fishing has been slow for the springs, you have to work hard to get a couple, but the ones you get are good size. Offshore is still good for pinks, coho and sockeye. Here is Boone and Rick with a pair of 28 pound chinook salmon. They are from Thailand and had never fished the ocean here." Spring salmon in the 20s and 30s are regularly being brought in, with Possession Point and Otter Point reported to be good. Below is some happy guests from Blue Wolf Fishing Charters: Terry & Lisa Mellett with good friend Greg, with 3 spring salmon up to 28.5 pounds, caught at the Trap Shack. If you get bored trolling for springs, there is endless action to be had out in the tidelines for pinks -- point towards the USA and somewhere around 300-400' depth, you will have some fun!